There have been a lot of people emailing me, messaging me, finding ways to get hold of me, to tell me that my FREE Stock Portfolio Tracker is not working. I thought if I don’t try to solve this, there will be no good sleep for me. So here are some explanations and how to get around this problem. Yahoo Finance Data is still Working NOT Working! Verizon’s purchase of Yahoo is going through, and we do not know how it will affect Yahoo Finance. However, Yahoo is still able to let us access to the data. Update 2017-11-4: Guys and gals, here is a further update, as of Nov 2, 2017, Yahoo have pulled their API and stopped us from accessing the data. This means that not just my spreadsheet is affected. Those people who uses Yahoo Data, which is the finance analysts on Microsoft Excel, their custom applications and software, other Google Spreadsheets are equally affected. I have a new post explain this cancellation of data. If you require end of the day Singapore stock exchange data feed to your Google Spreadsheet, read the article above. The relevance of this post has changed. You should read this more for things pertaining to my stock portfolio tracker. There is still a Google Spreadsheet problem. Please read on for the solution to this problem. Google Spreadsheet have prevented users in general from making multiple data refresh if no data is changed. This is a good practice, do not fault Google for this. If you read on, I will teach you how to refresh your prices in minute, hour, day intervals with Script Time Triggers. 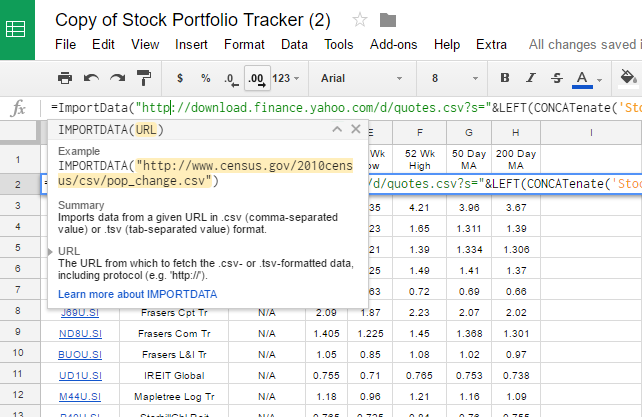 The Yahoo Price in Stock Portfolio Tracker comes from the sheets Yahoo Data Ref, Yahoo Data Ref USD, Yahoo Data Ref HKD. The Cell A2 in each of those sheet contains the formula that pulls the prices of stocks in your Stock Summary, Stock Summary USD, Stock Summary HKD. If you look at the image, it shows “#NA” basically it does not work. Hence in Stock Summary you cannot see the share price. Google Spreadsheet maintains a cache or stored cell result. If it seems that you did not make a change to the cell, it will not auto-recompute the cell. In our current implementation, Yahoo Data Ref, Yahoo Data Ref USD, Yahoo Data Ref HKD grabs the latest list of stock quote from Stock Summary and sends it to Yahoo to get the price data. If we do not change the list of symbols, that cell A2 will not recompute. The easy solution to this is to send something into the importData function that always changes. You have functions like Now() and Rand() that gives the time at this moment and a random number respectively. As we are always sending a new value with these two functions, this should work. However, Google is rather clever about this, and they know you will do that, so they do not permit any function that uses now(), Rand(), random() to work. So it is a refreshing problem. This means that you can refresh yourself. How? By changing the formula in cell A2 in Yahoo Data Ref, and then changing it back. Doing this will ask ImportData to re-grab the CSV data again. You will realize the data is still there. You will realize that the workaround method, is not very permanent. That will be a problem. I been trying to come up with a solution and did a lot of refreshing of the cell A2 but they all prove useless. This last one seem to last for a long time. The solution that I came out is on a similar concept. In this way, #1 is constantly changing and cell A2 in Yahoo Data Ref will work. If you make a copy of my Google Spreadsheet and use it as your own, you will need to set the trigger to refresh the field that contains the date time string. Step 2: Get Authorization to Edit & Run the Script and Permission to Link Script to Data in Spreadsheet. Before you can edit or run the scripts that I have help you created, you need to get permissions to execute the script. This is the sequence of steps to do. 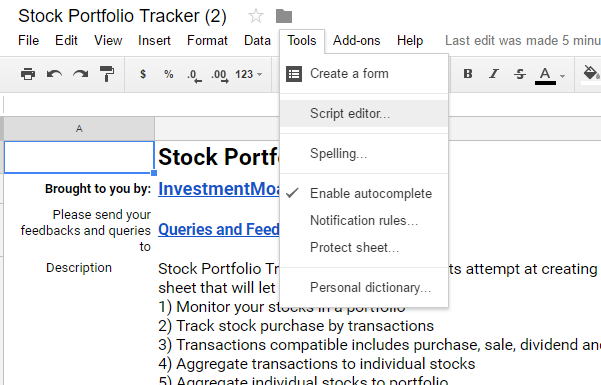 Note: This Step needs to be performed for those who make this copy of Stock Portfolio Tracker for the first time. 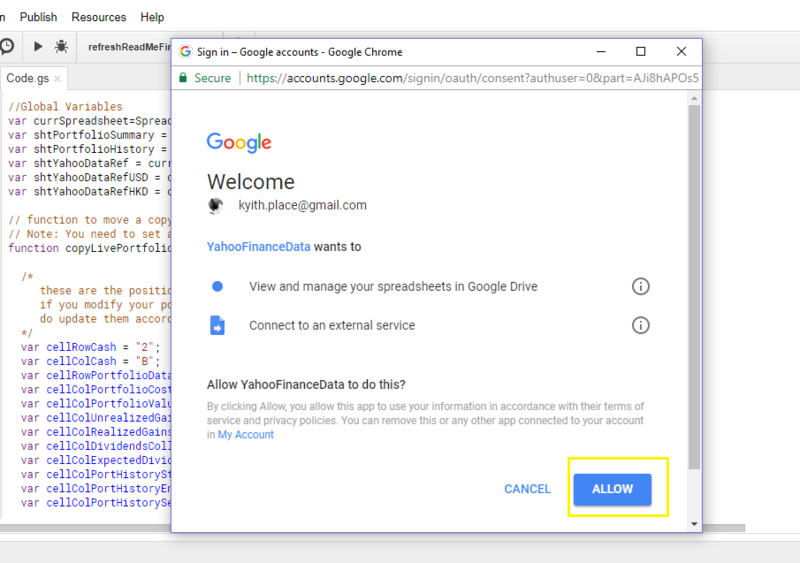 You will be prompt that Authorization is required so that your script (YahooFinanceData) can access to your data (your main spreadsheet Stock Portfolio Tracker). In the next screen, click Allow. Note: If you failed to do this Step 2 of acquiring permission for the script to access your spreadsheet data, you will get this We’re Sorry, a server error has occurred. Please wait a bit and try again. Now that you acquired permission we can continue to set the timer. This will bring up the panel. Also go to Tools > Script Editor… When my version is launch. 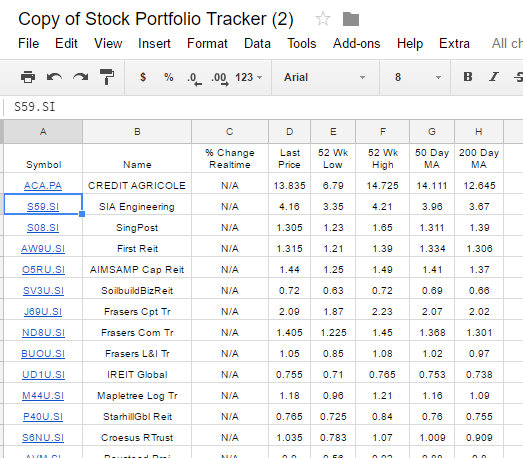 Step 2: in Your version if Stock Portfolio Tracker, go to Read Me First sheet. Insert a new row between Row 4 (Description) and Row 5 (Donate). This should eventually be row 5. Copy cell A5 and B5 from my version to your version. It should look like this. 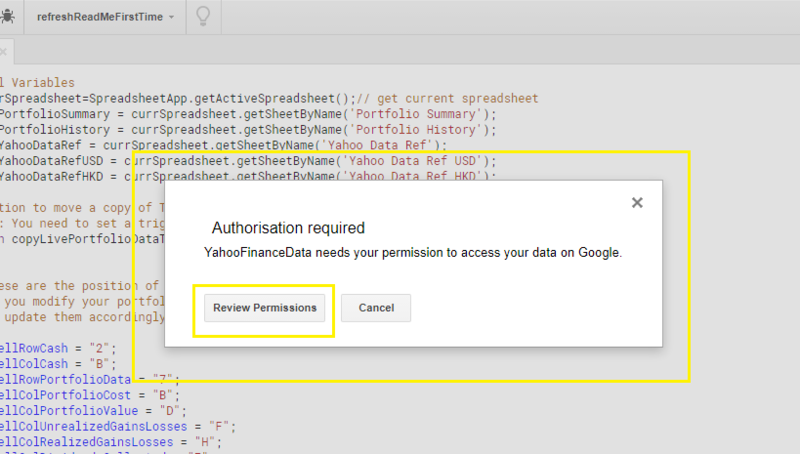 Step 3: Get Authorization to Edit & Run the Script and Permission to Link Script to Data in Spreadsheet. 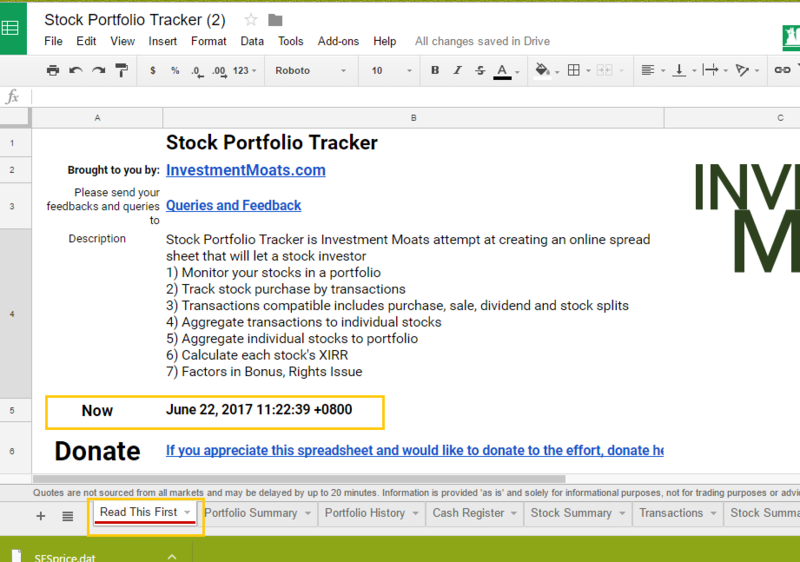 Note: This Step needs to be performed for those who make this copy of Stock Portfolio Tracker for the first time. If you have created your own script, or edit any functions in the past, this is not needed. Step 5: in your version of Script Editor, click on the Clock icon to launch the Triggers menu. 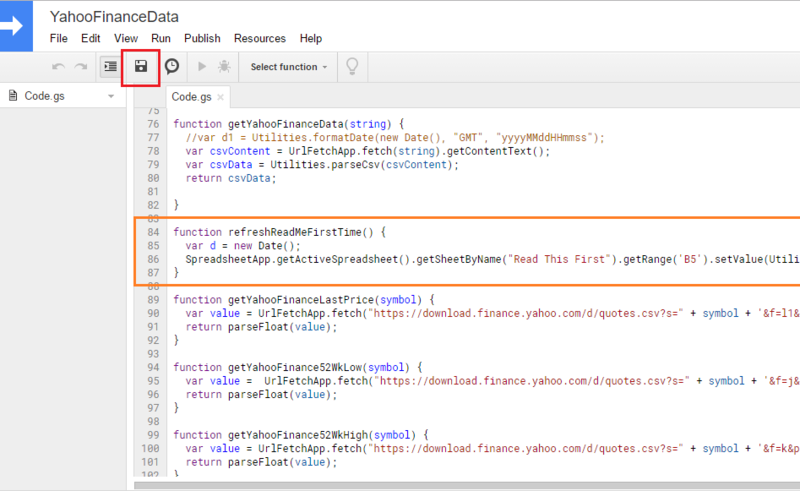 Step 6: Modify the cell A2 in your Yahoo Data Ref, Yahoo Data Ref USD and Yahoo Data Ref HKD. What you are doing is appending the date time string in cell B5 in Read Me First Sheet, into the Yahoo Finance data retrieval process. If you do correctly and press Enter, you should see that you are able to retrieve the data like what is shown in the image above. Do the same for Yahoo Data Ref USD and Yahoo Data Ref HKD if they are in use. Step 7: if you done everything correctly, the cell B5 in Read me first sheet should change. That should trigger a change in Yahoo Data Ref. Not the most elegant solution but it looks like it works. I tested it for 2 days and this solution seem to work. If you need help porting, even after this guide, my support is open at [email protected]. I do levy a support charge of USD10.00 through Paypal. Email me and I will guide you through the details. First of all, thank you for your portfolio tracker. Recently, I have issue with the yahoo finance price feed. I have switch to the script you introduce earlier “getYahooFinanceLastPrice”. It seems to work better than using importdata function. ha ha, that one if it works better for you then keep it. I just felt that calling the function every time looks very heavy on processing. Hi Bea, if you would like to , share the sheet with me at [email protected] and I see what is the issue. Haiz, Yahoo Finance so problematic. Strangely, I’m not experiencing the above problem even though I’m using your portfolio tracker. Hey Intelligent Nerd, If its not having any issues then its a good thing isnt it! What is R script btw? Yup. It’s a good thing. R is some statistical computing software which I’m picking up in order to help me in my day job + investing. Yahoo Finance recently removed their API key and it led to the failure of some investing apps (and, for me, my R Script that depended on it). Just sharing. Thank you~ it keep data updated always. 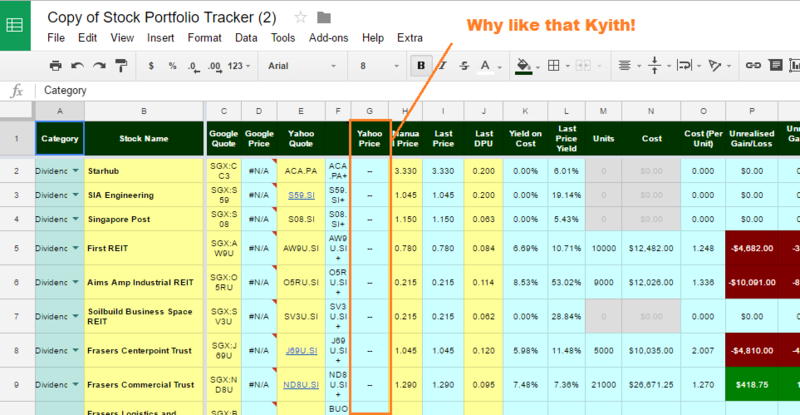 Hi Kyith, thanks for your spreadsheet. I’m not using the HKD spreadsheets but when I delete the rows, I get the “#DIV/0!” errors under “Expected Annual Dividend Yield” of the “Portfolio Summary” spreadsheet. Possible to catch this exception? Hi Jason, i cannot fix this. If you are not using HKD then modified portfolio summary to remove the HKD rows. Unfortunately, the new approach does not work for me. I experimented a number of ways but cannot get it to work. Will continue to find other ways and once proven to be working consistently I’ll post here. I tried to save the trigger but I end up getting the “We’re sorry, a server error occurred. Please wait a bit and try again.” error message. The “copyLivePortfolioDataToHistory()” script also doesn’t seem to be working. Hi Kyith, there was no prompt to allow permission. 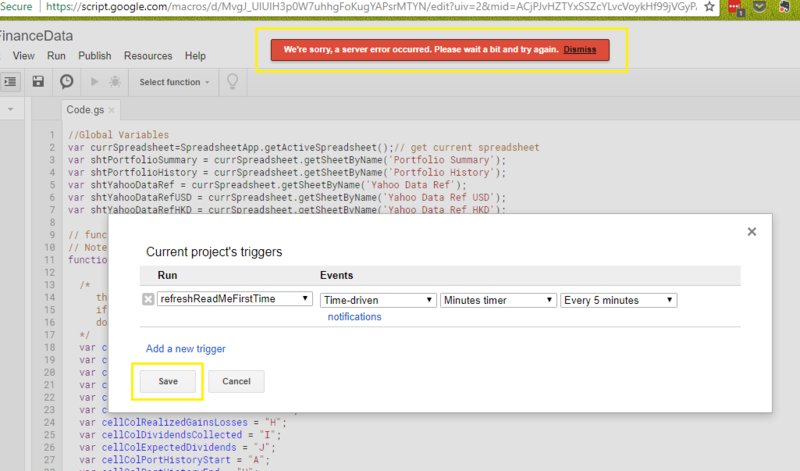 I just took the script as is and tried to add the triggers as per your instructions and got the error messages. I’ve shared the spreadsheet with you. Jason, i think i fixed your sheet. do take a look. think its permission issue. We have to try and run the function once. My bad. Hi Kyith, your solution worked for me. Thanks. Hi Kyith, I am seeing similar error message with “We’re sorry, a server error occurred. Please wait a bit and try again.” Could you kindly advise how to fix this? Thank you so much. To solve it, I made some insignificant change to the script (such as adding a space behind the comment line) and saved it. Then that server error will not appear. Its been weeks and I have tried various ways but my spreadsheet does not work. It is now always stays as ‘Loading…’. 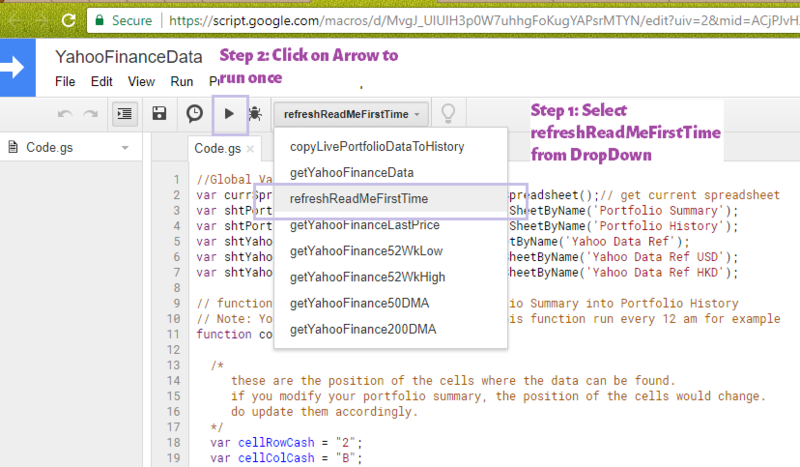 Just because of this yahoo api the whole awesome tracker is becoming less useful. I’d love to get this resolved. All the help todate and any more is much appreciated. Hi Chetan, can you go to your script editor to try run the function refreshReadMeFirstTime() at least once? I have run the function multiple times and it does update the date/time. However, the yahoo api does not finish loading (stuck at ‘Loading…’). Hi Divy123, did you copy and paste a sheet on its own into your own sheet? First I made a copy of the entire spread sheet document on your website from link. Then I went into Stock Summary and deleted your stocks and input my own stocks and symbols in the yellow cells. After that I filled in my stocks on the transactions sheet, then went to the cash register sheet and deleted your entries and filled up with mine. 1. it still shows your holdings. I am not able to copy the function refreshReadMeFirstTime() in your file. When I click on Script Editor in your file, nothing come out. Could you pls advise? Did you make a copy of my spreadsheet at File > Make a copy first? Thanks, I got it. But I found another problem, the Script Editor in my file is totally empty. How to solve it? Hi Allan, you have to put my functions, in this article into the script editor, then save the function. are you able to do that? Recently I had issues with my own watchlist for stocks. I tried your method including scripts in google sheets. but it still doesn’t work. Thank you for replying. I manage to get it working. Guess I was calling the api too much by calling it for every individual ticker. Just that I will still get email notification about script failure even though it works. hi Jonathan, that means that there is still some failure. could i clarify what you meant by calling every individual ticker? I found out the failures are because of old scripts i experimented on. I meant that i was calling the api for every ticker. Thank you for sharing this novel solution! ah yes. you can pipe it in a string. you can refer to my yahoo data ref. what i am doing is take all the z74.si+ , cc3.si+, 5dd.si+ and concat them together, then feed them in. My Script Editor do not have all the functions show at Step 4. I am also not able to copy all your function into my Script Editor. Pls advise. why can’t you copy in? what is the error you get? Hi Kyith, I realized that the “Currency Conversion Ratio” doesn’t affect the base amount so when I add something but with USD currency ratio, it adds the raw raw number and not the converted number. Hi Jason, you must be referring to the Cash Register. The currency conversion ratio is meant to be a note column for you to keep track during that time what is the conversion rate like. if you wish to create a formula for it, by all means. I prefer to keep that portion simplified so that advance users can make it more sophisticated while not scaring off the newbies. Hi, thanks so much for the spreadsheet. Some problem happens today. The time stops at July 27, 2017 04:58:43 +0800 and no longer refresh for my spreadsheet. I can refresh it manually but the trigger doesn’t auto refresh. I am seeing the same issue on my personal copy as well as yours. (Downloaded a copy to test.) It appears that yahoo must have changed something, so no data is downloaded. Is it possible that download.finances.yahoo is no longer working? Thanks for your great work btw! Hi Kyith, You have produced an excellent instrument to keep track of stock dealings. Many thanks for being so generous in offering it to us all free of charge! I’m based in London, England and have been buying and selling stocks & shares on several platforms since my retirement over 8 years now. I’m very keen on your spreadsheet which could help me keep track of my dealings. But unfortunately, it’s linked to the Singapore stock exchange and is in Dollars. 1. Do you have a version for the UK market in GBP (Pound Sterling £) and picking prices from Yahoo.co.uk and Google.co.uk ? 2. Is it possible to create seperate columns for Dealing Charges, another for Stamp Duty, and for Platform charges? 3. Could it calculate Capital Gains on stock sales for each Financial Year from say, 4th April 2016 to 3rd April 2017 etc..? I await your reply in earnest. Keen to know whether you will be developing an alternative means to retrieve the data? I had the feeling…(and had posted another comment somewhere on this site.) Got the same error you are mentioning and started looking into an alternative. 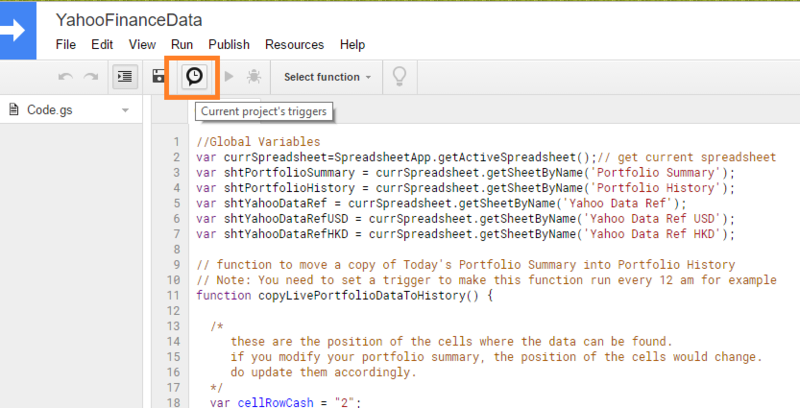 Alpha Vantage supports financial data via an API – just reading about it. I very much like the spreadsheet and would love to keep it. Maybe we can find a different data source altogether. Hey Chris, I heard every one say about Alpha Vantage, maybe I can try to modify to include Alpha Vantage, its data is USA data only right? It seems that Yahoo has no longer allowing us to fetch the stock data. Any of you experience the same as me?